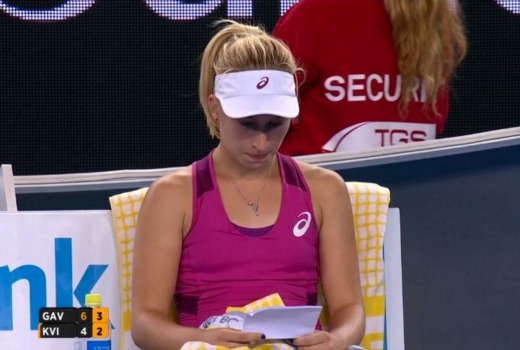 Concerned Australian Open viewers took to social media last night after Seven broadcast a shot of Daria ‘Dasha’ Gavrilova’s coaching notes in close-up -not once, but twice. New Daily reports Seven froze and zoomed in on Gavrilova’s notes motivational notes in her bag, supplied by her coach Nicole Pratt. Seven commentators also proceeded to dissect some of the information designed to help her defeat Carla Suarez Navarro. In the end the Aussie lost regardless, 0-6 6-3 6-2. @GeorgeDonikian Agree! Notes like that are obviously written for her eyes only and she wouldn't expect them to be broadcast to all & sundry. I missed this while flicking between tennis and cricket. However I thought that on court pictures were all produced by Tennis Australia now and channel seven just use their own commentators. I believe this change was made for last years tournament but I’m not 100% sure. But it does make me wonder if channel seven is at fault here. I’ve read too that Tennis Australia takes the footage. So I think maybe the question is whether or not channel 7 can choose from that footage what it puts to air? Yesterday I was watching some of the djockovic vs simon match on 7tennis website. I had the specific match stream on with one set of commentary from someone I didn’t know. When there was a bit of glitch and site reset itself it automatically put me on the channel 7 stream which had bruce and jim. When I put it back to the match specific stream back to different commentary. Given the terrible picture quality of 7’s broadcasts, how could anyone read it? I was watching both the tennis and cricket last nice so I missed this part. I think this is wrong and an invasion of privacy. The age has an article on the same issue with a photo of one of the pages that aired on 7. I think if your going to include a photo of one of the pages as they aired on 7 you need to make the writing ineligible to the reader of that article. If your going to write an article about someones invasion of privacy and include the item that invaded her privacy how is that any better? wow thats terrible, i doubt she lost because of it tho. How was she meant to know it was happening? Her coach Nicole Pratt was on sen this morning and wasn’t aware of it. If she doesn’t want them read don’t take them on court. It’s as bad as taking notes into an exam. What’s playing a sporting match got to do with an exam? Completely different situation. They aren’t supposed to be allowed coaching in a grand slam, so taking notes from a coach in is the equivalent of tweeting. And really if you can’t grasp the basics of your strategy without having it written down for you you’ve already lost the mind game at least. During actual match play a coach can’t sit there and coach from the sidelines. But having a few notes that were organised before the match is different. If they weren’t allowed don’t you think we would’ve heard about it by now? People learn, operate, adapt and handle pressure in situations differently. When someone’s say under pressure, if reading a piece of paper reinforces thoughts and strategies that were established before the match, where’s the harm? I was switching between Cricket and Dasha and saw notes displayed several times.. I thought these notes must have been released to the media. Doesn’t surprise me, 7 are very arrogant in their sports presentation. What don’t people on twitter criticize.